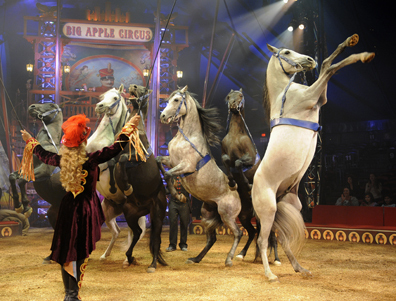 The Big Apple Circus has returned to Boston, this time with "Legendarium," paying tribute to the history and traditions of the circus genre. Having pitched its Big Top at City Hall Plaza in Government Center, the 35th anniversary edition of the Big Apple is in town through May 12. Jenny Vidbel follows (above), putting her troupe of horses and ponies through their elegant paces. In the second act, she returns with a merry group of playful pooches (all of whom are rescue dogs). Daniel Cyr, inventor of The Cyr Wheel (a gigantic hoop which he rides and twirls in and on) was a crowd pleaser, as were the Dalian Acrobatic Troupe of synchronized, trick cyclists from China (at left). The seven Dalian ladies race around the ring, at one point with two riders leaping from their own cycle to another, landing on the next rider's shoulders while en route. Contortionist Elayne Kramer is amazing, bending her spine into a Z formation that was actually painful to look at. She also proved proficient performing an intricate bow and arrow shot with her feet. Zhang Fan shows his skill on the slack wire, including performing a headstand on the wire itself as it pitches back and forth. 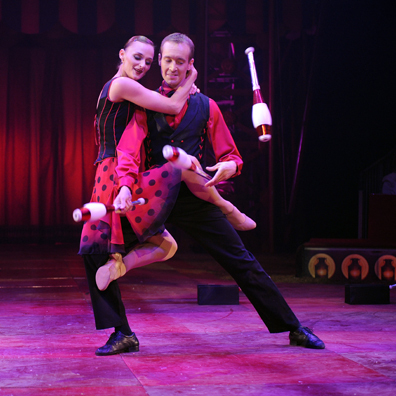 The standouts in the company include: Desire of Flight, the Russian duo of Valeriy Sychev and Malvina Abakarova, who perform beautiful and stunning acrobatic moves in midair; and juggler Menno Van Dyke (at left) who performs an intricately choreographed tango with Emily Weisse while juggling. Menno's skills would be enviable on their own, but to see him go through the passionate musical number while constantly juggling balls and clubs was well deserving of the thunderous applause that followed. The clowning this year is in the hands of Acrobuffos, a husband and wife team from the United States. A good deal of their act relies on audience participation, and they had the bad luck (on Saturday afternoon, at least) of choosing individuals who just weren't right for the gig, which wound up grinding the pace of things. Under the artistic direction of Guillaume Dufresnoy, this year's edition is directed by West Hyler in his Big Apple debut. As always, the Big Apple Band keeps things bright and peppy under the expert direction of maestro Rob Slowik. 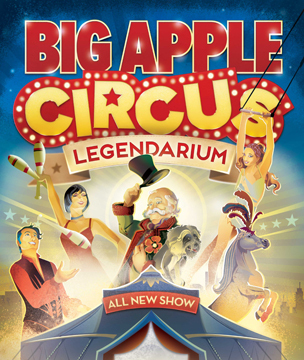 "Legendarium" from The Big Apple Circus is City Hall Plaza through May 12. For information, call 888-541-3750.